The following is a list of classes and seminars being offered at the Log Cabin Shop. If you have ever wanted to learn the skills of Early American craftsmen Log Cabin is once again offering a variety of classes taught by expert craftsmen and craftswomen. Students will have the opportunity to learn a new skill or polish-up an old one in a relaxed atmosphere. All class sizes are limited so students always have intense one-on-one help from the instructors. New classes are always being added so please check back often. Any questions are welcomed and can be answered by contacting us. This class will be for the beginner builder covering all the fundamentals with step by step instruction from beginning to completed muzzle loading rifle. The class will start with a pre-shaped, pre-inlet stock (either full stock or half stock) and and furniture of your choice. Guns may be either flintlock or percussion and may have a wide variety of brass or steel hardware. Students are welcome to come early or stay later for more time to work. The classroom will also be available for students to work throughout the week during regular store hours. Class size is limited to 10 persons - Pre-Registration is required! A deposit of $50.00 is required at time of registration with balance due by 09/01/2018. For more information about this event contact us at 1-800-837-1082 or email us at: webmaster@logcabinshop.com. A gunsmith since 1967 and head gunsmith at Ohio Village Gunshop at the Ohio Historical Society in Columbus, Ohio for over ten years, Michael Lea is an accomplished artist. On the Rendezvous circuit he is Mike Lea & Daughter-Gunsmiths, also known as the “Gun Doctor”. He is listed in the Williamsburg catalog of Master American Craftsmen and Early American Life’s Traditional Craftsmen. This three-day seminar will be limited to six (6) persons w/ intense personal instruction and hands-on contact The Basic "how-to's" of Metal Engraving. Each student will receive a basic set of tools, workbook and textbook that is theirs to take home.Amateur Gunsmiths, Knifemakers and Jewelers are invited. The focus of this class will be on learning and understanding how to make grind and use metal cutting gravers. Correct cutting angles and the manipulation of the tools will be stressed and demonstrated on a variety of metals. Layout and transfer techniques will be geared towards the beginner and non-artist. Some lettering will be covered, but will not be the main focus. For more information about this event contact us at 1-800-837-1082 or email us at: logcabin@logcabinshop.com. Class size is limited to 10 persons - Pre-Registration is required! A deposit of $50.00 is required at time of registration with balance due by 12/15/2018. 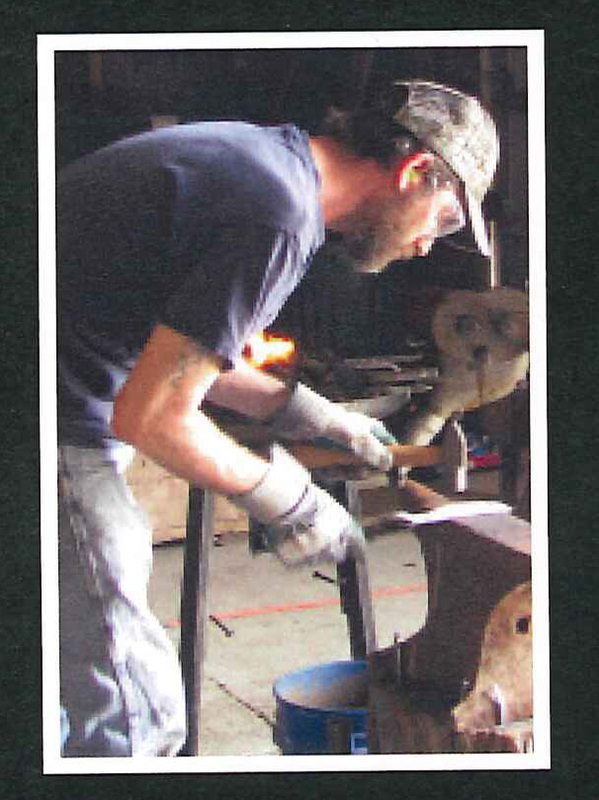 Learn tips & techniques from experienced artists and blacksmiths both featured in numerous publications including The American Tradition, Muzzleloader & Muzzle Blasts. Learn how to make from raw materials a basic yet fully functional knife styled after those of Early American blacksmiths. 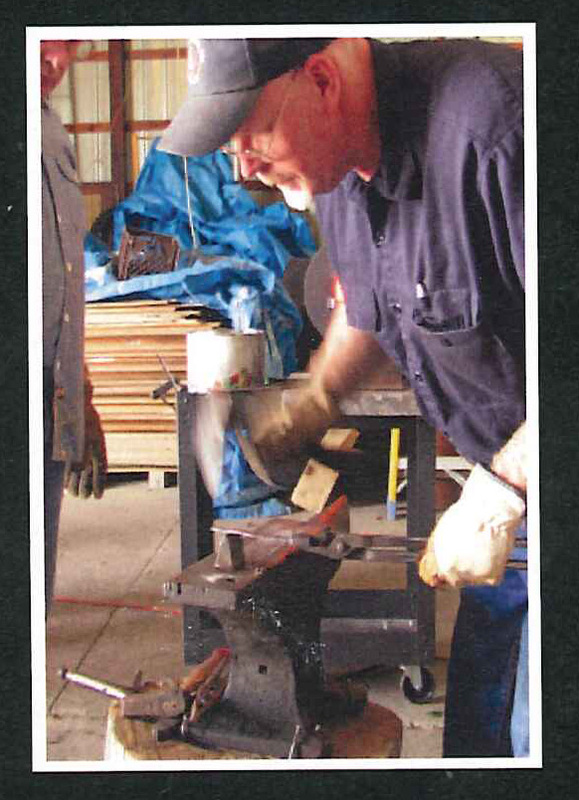 Students will learn how to hand forge a high carbon steel blade and temper it properly for maximum performance, then assemble a knife with the blade using traditional handle materials. Learn how to build and maintain different types of coal fires for working and for tempering, plus successful blade hardening. Blacksmithing experience a plus, but not a requirement. Class fee includes coal, steel and all materials to complete the project. Students need to bring: Eye & ear protection, Gloves, Suitable footware. Class fee is $300.00 per student. Pre-registration is required. Make a simple but functional powder horn. Completed horns will have a flat wooden base plug and a wood peg stopper. "Staple" style attachments for a strap will be added to the completed horn. Some aging techniques will be covered as time allows. Students need to bring a polished horn blank of their choosing (or pick one out here before class), 1 coarse and one smooth flat file. The remaining materials will be included. Class fee is $40.00 per student. Pre Registration Required. Class size is limited, bring a friend and sign up today! Maryellen has been widely featured in industry publications including Muzzleloader, Muzzle Blasts, American Long Rifles Forum, the Contemporary Makers Blogspot and more for her superior quality leatherwork. Don't miss this opportunity to learn from the best If you have some leatherworking experience you will be sure to sharpen your skills; it you are a beginner, there is no better place to learn. 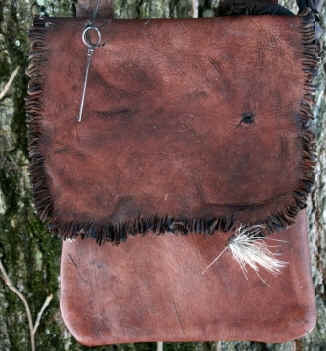 In this class each student will design and create their own period correct hunting pouch. The finished project will be approx. 7" x 7" in size and may have gusset, lining or pocket depending on your ability. The project will then be aged to have the look of a real piece of history. Class size is limited to 10 persons - Pre-Registration is required!